Mickey Mouse jumbs from Steamboat to Rocket Ship and here's how you can too! I will show you in the following paragraphs why you should jump onto this Steamboat Willie. Only this time the Steamboat Willie is strapped to a rocket ship, and the returns from purchasing this stock will take your profits to infinity and beyond. Before we talk about Star Wars, let’s take a look at the company and its competitors. Disney owns ABC Television Group (ABC Family, etc. ), 80% of ESPN, Marvel Entertainment (which makes movies like Iron Man and The Avengers), Pixar, and of course Disney Parks and Resorts. Disney is spread across a wide variety of entertainment markets. ESPN continues to be the premier sports broadcaster, Disney Parks and Resorts continue to be named as the number one vacation destination for families, and Disney Cruise Lines continue to be named one of the top cruise lines in the industry. Its studios produce some of the highest all-time grossing movies, including Toy Story (10th), Pirates of the Caribbean (9th), and most recently The Avengers (3rd), grossing $1.5 billion. Despite having its hand in virtually every sector of the entertainment industry, Disney consistently out-performs its competitors with a net income increase of 17.4% from $5,258 million in 2011 and $6,173 million in 2012, and it has consistently paid out an increasing dividend over 20 years. With an EPS (earnings per share) of 3.10, Disney generates similar earnings per share compared to other movie competitors like Viacom (NASDAQ: VIA), with an EPS of 4.26. Viacom's Paramount Pictures produced the box office hit Titanic. Viacom owns popular television networks such as Comedy Central (home of the popular The Daily Show with Jon Stewart and The Colbert Report), BET, Nickelodeon, Spike, and MTV. Movies released by Viacom's main movie producer Paramount Pictures during fiscal 2012 included Mission Impossible: Ghost Protocol, Paranormal Activity 3, The Dictator, The Adventures of Tintin, Puss in Boots, and Titanic 3D. However, upon looking a Viacom's annual report for 2012, we see a revenue drop of 40% in the theatrical filmed entertainment (movies) division, from $2,175 million in 2011 to $1,310 million in 2012. However, other divisions of the company did well, like the media networks division increasing operating income by 13.8% from $3,381 million in 2011 to $3,848 in 2012. Overall the combined results of all divisions resulted in an increase in operating income of 5.1% from 2011 to 2012. The dividend payment issued by Viacom in 2012 also increased to $1.05 from $0.80 in 2011. While revenue decreased, the company's profitability didn't. The large decrease in movie revenue may have been due to the fact that Viacom's production companies did not release a 'hit' movie in 2012. The performance of this company from 2011-2012 indicates a solid company with growth that pays out a good dividend to its investors. However, compared to Disney, Viacom is not growing as fast looking at the operating/net incomes. Disney's net income grew 17.4% while Viacom's operating income only grew 5.1%. This shows how successful Disney and Buena Vista was in producing movies like The Avenger's and with Disney's plans for a sequel to it and the advent of Star Wars in 2015, Disney is poised to maintain its leading growth in the movie industry for at least five years. Another of Disney's competitors, Time Warner (NYSE: TWX), produced the Harry Potter films, Batman films, and Argo (Academy Award for Best Picture 2012). Time Warner has an EPS of 3.09, operating income increase of 21% between the end of 2012 and 2011, and recently increased their quarterly dividend by 11% to $0.287 per share. These results speak to Time Warner's amazing production of popular movies in 2012, and is another well financed and structured company that provides increasing dividends. But just how valuable was Disney's purchase of Lucasfilm, and how much will this $4 billion investment put Disney ahead of its strong competitors? With Lucasfilm, Disney owns the rights to produce and sell Star Wars merchandise, create Star Wars themed rides, make video games, and create movies and spin-offs. Perhaps Disney will even create a theme park. The possibilities are endless. Star Wars also extends across multiple generations. Kids are still crazy about Star Wars! At Disney's Hollywood Studios theme park a live Star Wars show called "Jedi Training Academy" was implemented some years ago next to the famous Star Tours ride. As if the concentration of children in Disney isn't high enough, this show manages to gather them in even greater hordes. Kids have an interesting role in Disney's success. Kids drive the parents to visit Disney, and thus kids drive the revenue. By incorporating Star Wars into their image, Disney has effectively secured a monopoly on the magical sense of adventure children strive for. This investment not only helps Disney’s movie companies like Buena Vista, but also helps their parks, their merchandising, and their overall attractiveness to children and adults. With one single purchase Disney has effectively secured a unique position in their entire entertainment market for years. Today's children will grow up loving Disney and Star Wars, then bring their children to relive those cherished childhood memories. The purchase of Lucasfilm was a stroke of pure genius. Disney's stock has risen about 17% since the announcement to purchase Lucasfilm released in November 2012. I am extremely confident in this stock as a long-term investment. However, wait until the stock can begin to reflect Disney’s massive gains from Star Wars. 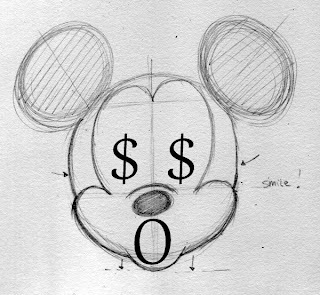 Over the next 5 years Disney’s revenue will drastically increase and its stock will potentially double from its current price. The revenue increases will not drastically increase until 2015 when Disney plans to release its first Star Wars film. I encourage all investors to immediately buy The Walt Disney Company and hold onto it until at least 2015. Until that time, may the Fool be with you. It's easy to forget that Walt Disney is more than just the House of the Mouse. True, Disney amusement parks around the world hosted more than 121 million guests in 2011. But from its vast catalog of characters to its monster collection of media networks, much of Disney's allure for investors lies in its diversity, and The Motley Fool's new premium research report helps investors decide whether they should buy Disney today. This report includes the key items investors must watch as well as the opportunities and threats the company faces going forward. We're also providing a full year of regular analyst updates as news develops, so don't miss out - simply click here now to claim your copy today.